Tiwi Munch Lunch Set consists of 1 Rainbow Tumbler and 1 Tiwi Sandwich keeper which allows you to pack a complete snack for your child. 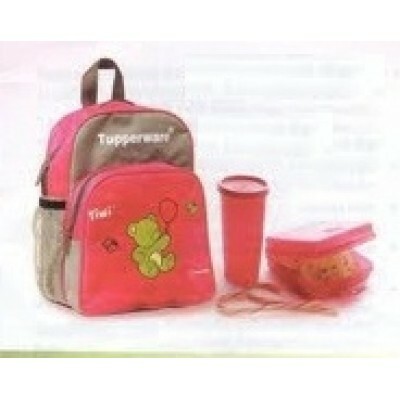 Tiwi Munch Bag is a bright and smart back-pack and ideal size for a child to carry to school along with the books. Capacity – 300 ml, 13.9 cm (L) x 13.2 cm (W) x 5.2 cm (H). One piece container means no seal to keep track of or to get lost. Hinged over is easy to open with one hand. Holds an average sized sandwich or snack. Fits comfortably into backpacks, briefcases, and also in a hand bag. * Kids with the bright and colorful Tiwi Munch, look forward to their lunch break every day. * Pack juice in the liquid tight tumbler and a fruit in addition to a snack, all neatly fitting in the Tiwi Munch Bag. * Give your child nutritious and refreshing fruit juices squashes or lassie in the Rainbow Tumbler. * Your child will love the taste of sandwiches, noodles, rice or chapattis rolls, kept fresh and soft in the Tiwi Sandwich Keeper. * You will find enough space in the bag for your child books, note books and pencil box along with the Rainbow Tumbler and Tiwi Sandwich Keeper.